Most people make home renovations because they want a new look, according to a survey by flooring retailer Empire Today. Homeowners who take on home improvement projects tend to focus their effort in the kitchen, the survey said, adding everything from appliance upgrades to new cabinets and countertops. 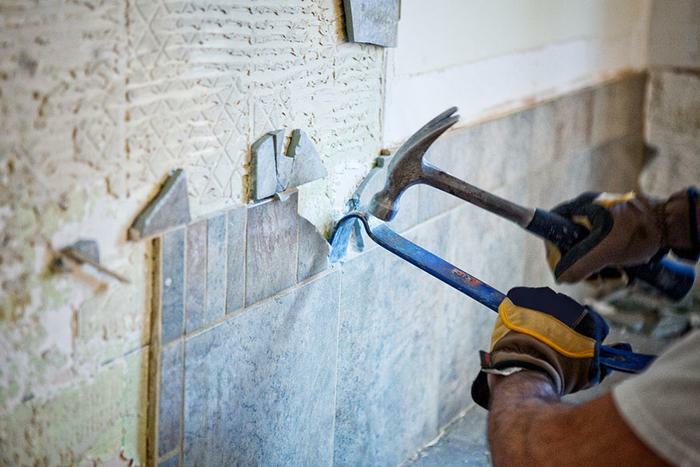 About 54 percent of homeowners renovating their homes made improvements to the kitchen, 45 percent updated bathrooms, and 42 percent renovated bedrooms. Painting, flooring, and outdoor renovations were the the most common home improvement projects. Half of all projects included a fresh coat of paint, often to change a room's overall color scheme. Painting has two big advantages; it's an easy do-it-yourself project and a can of paint isn't that expensive, when measured against the effect it can have on a room. Soaking brushes in fabric softener after use will keep the bristles soft for the next day of painting. A good mixture is a half cup of fabric softener to one gallon of warm water. In addition to painters tape, keep plastic wrap close by. It's perfect for protecting large items that can't be moved. Painting around hardware can be a challenge. Smear some petroleum jelly on the metal and if any paint gets on the screws or hinges, it won't stick. Also, spend a few extra dollars and buy a premium grade paint. It will not only look better on the surface, you might be able to get away with one coat instead of two. In the kitchen, you might not need to replace cabinets if they are in good shape. Consider a fresh coat of paint and some custom knobs and pulls to give them personality. Vintage knobs are trendy and you can probably install them on all your kitchen cabinets for less than $100. Lighting is another area where homeowners can make significant improvements on a budget. According to HGTV, lighting requirements differ for each room. In a living or family room, the HGTV experts say “layered” lighting often works better than recessed lighting. Light that bounces off the ceiling will provide soft, ambient illumination. Kitchens usually require a combination of ambient and task lighting. Task lighting is especially functional over counter tops and the sink. Replacing old sink fixtures is an easy and inexpensive way to update a kitchen or bath. Faucets are things you use every day and a modern model that matches your décor will not only add beauty but function too.